You never know when you’re gonna meet somebody… Back in November I was working at a job fair. As time there can get really long (especially in the afternoon hours), I was strolling around and chatting to the other exhibitors. One in particular caught my interest. 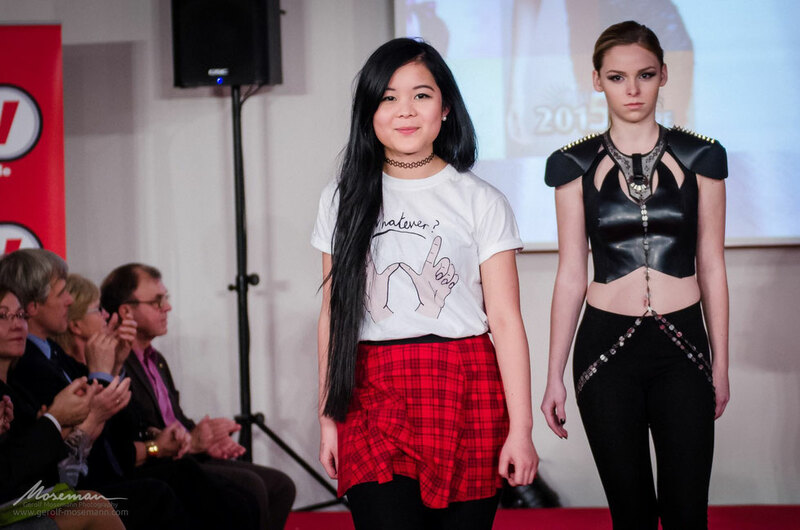 It was the young fashion designer Phuong Mai. At that time she was still sewing one of her dresses in order to prepare for her public presentation. I was interested in her work and told her about my passion for photographing fashion. Since having contacts is never wrong, we became digitally connected. Waiting for the show. 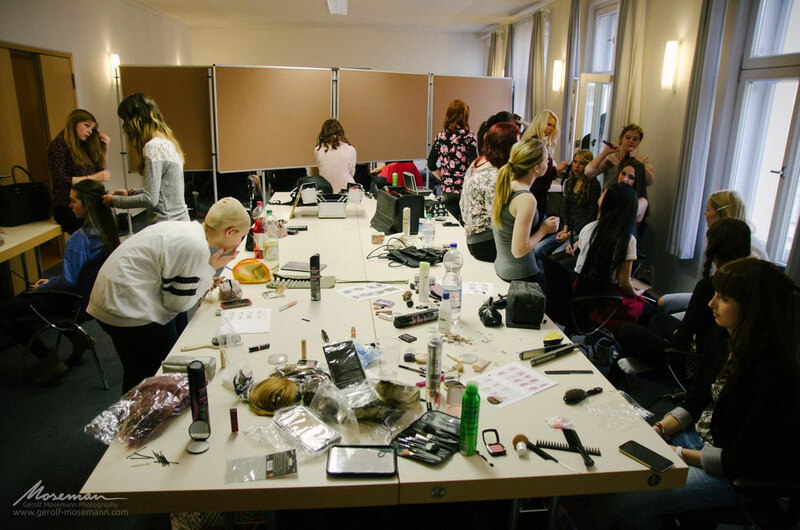 Backstage at Berlin Fashion Week 2015. Then in early January my phone rang. You will be able to guess who it was now, but at that time I was admittedly surprised. Mai asked if I want to accompany her to Berlin Fashion Week where she would showcase her dresses. Needless to say how happy I was about this invitation. So we cleared what pictures she had in mind and set the time to meet in Berlin. Everybody helps each other, while time is tight. It is a hell lot of work to prepare the dresses and models for the big show: We met at 10 am, the hair and make-up work started at 11 am, but the actual show was planned for 6 pm. The designers had to agree on a schedule when to paint the models and which model is needed for which dress and how much time is needed to change her. My initial thought was that six hours is more than enough and that people should be more relaxed. 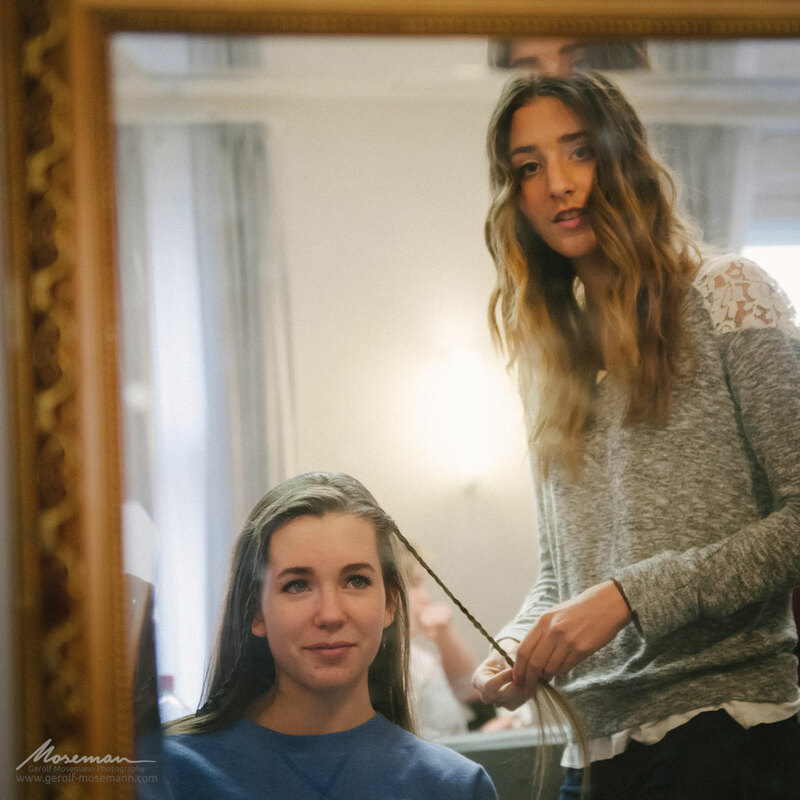 But when I saw the small room I started to understand: Several teams shared the narrow space, respectively consisting of makeup and hair artist, designer, model and sometimes also a photographer. For me it was often nearly impossible not to stand in somebody’s way and get my shot. Getting ready: Behind the scenes in Berlin. The actual show was a pleasure to watch. Having talked to most of the girls in advance, having seen them without makeup, having figured all the work and stress being put into this performance, the show quite left an impression on me. It was wonderful to see how much they have changed and with how much self-confidence they presented the dresses. Photography-wise however, I found it pretty challenging. With so many spectators it was not easy to move around or raise my camera without being told off for being in someone’s sight. So having completed my task for Mai, I decided for enjoying the show rather than provoking further confrontations. After all the stress finally some relieve: fashion designer Mai and her model Svenja after the presentation. In the end I felt really grateful for having not only been a witness to the fashion show, but having been a part of it. I guess looking behind the scenes, getting to know the people involved, feeling the atmosphere and excitement will be always something which fascinates me. Watching the change in people’s faces, expressions and habitus ads up to that. All in all I will hope it will not be my last fashion show to enjoy!